No matter how carefully you plan, life has a way of throwing curve balls when they're least expected. You might move into an apartment with long-term intentions, but a new job or new family member could change things fast. So what happens if you have to break your lease? Our Springs management team sheds some light on the purpose of a lease, the effects of early termination, and what options you may have. Why is a Lease Necessary? A lease is a legally binding contract in which both parties agree to exchange consideration, which simply means something of value. In this case, the owner or management company offers possession of an apartment in return for regular payment of rent. 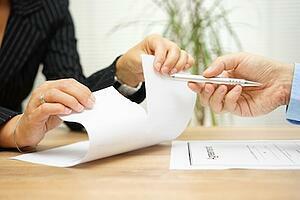 In addition, a lease protects the rights of both parties by specifying terms of the agreement. While you receive "quiet enjoyment" of an apartment that meets acceptable living conditions, the landlord is assured of income from that apartment for the duration of the lease. If you choose to move out before the agreed-upon end of the lease, it disrupts the balance of consideration. You have the freedom to leave while the landlord is faced with the unexpected expense of re-renting the apartment and the loss of income before a new lessee is found. For that reason, a financial penalty is generally incurred with early termination. Amounts can range from a flat fee to the full balance of the remaining term. The landlord does have a legal responsibility to mitigate damages by making a good-faith effort to re-rent the apartment, so having a qualified person ready to lease the apartment may work in your favor. If you enter military service, you can break your lease after providing notice. You can also legally break your lease if the landlord fails to maintain adequate living conditions. Each state has corresponding statutes governing this procedure, which is known as "constructive eviction." Apartments are subject to the Fair Housing Act, which prohibits granting "different terms, conditions or privileges" in rental agreements. In the interest of complying with equal treatment for all, you should be prepared to be responsible for the balance of your lease if you request early termination. Make sure you are fully informed by reading your entire lease and understanding the terms and conditions for breaking it. While there are many good reasons to break a lease, think twice about your reasons for wanting to leave, and weigh the pros against the cons. As a resident of our Springs luxury apartment homes, your happiness is our main concern. We understand that life holds many changes, so we will release you from your lease within 30 days of move-in if you're not satisfied. Stop in and talk to our on-site management team if you have any questions about your lease.